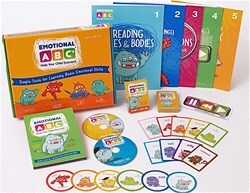 Launching Today, Emotional ABC's Activity Kit/DVD is a Breakthrough Parenting Resource that Teaches Basic Emotional Skills to Children (and Parents). teaches children (and parents) basic, proven techniques to identify, understand and work through their emotions." Launching today, Emotional ABC's Activity Kit/DVD is the only at-home parenting resource that uses simple techniques to help children (ages 4-8) acquire basic emotional skills. Emotional skills are especially valuable when learned young and multiple studies prove that emotional intelligence is more important to a child's lifelong happiness and success than IQ. This weekend, the lead article of the New York Times Magazine Education Issue is entitled, "Can Emotional Intelligence Be Taught?" In the article, Harvard psychologist Stephanie Jones discusses the complexity of teaching social-emotional skills to children and commented, "For a child to master empathy, she first needs to understand her own emotions." Emotional ABC's Chief Creative Officer, Cynthia Sikes, agrees. "Our program is called Emotional ABC's for a reason. We focus on the emotional component of social emotional learning. We teach children (and parents) basic, proven techniques to identify, understand and work through their emotions. Learning the 'emotional ABC's' creates a foundation on which to build more advanced social skills." When Sikes tried to help her own children with basic emotional skills, she couldn't find a practical guide for kids that would also show her how to model better emotional literacy. She and her husband worked with therapists, psychologists and educators to create Emotional ABC's, a parenting resource that combines optimal techniques used by mental health professionals with a developmentally appropriate, hands-on format for children. Emotional ABC's shows children how to identify feelings, recognize sensations, and answer basic questions about well-being: What am I feeling? Why am I feeling this emotion? What's the best choice for me in this particular situation? A 40-minute DVD - the core of the Emotional ABC’s. Five Activity Books - reinforcing concepts presented in the DVD. Moody Music CD - an Award-Winning film composer's rendition of various moods. Playing Cards featuring Moody, a cuddly monster from Emotional ABC's. Colorful Stickers to help children identify changing moods. Emotional ABC's Toolbar magnet - a visual cue to help children remember newly learned skills. 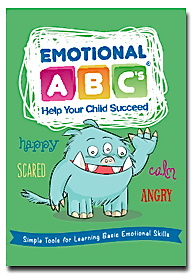 Emotional ABC's is now available at http://www.EmotionalABCs.com for $129.99. Please find more information and videos at http://www.EmotionalABCs.com.